I need very little excuse to rave about Kiehl’s beautiful Crème de Corps, but a limited edition version of the beauty essential came across my desk this week that I got rather excited about. The New York brand has collaborated with iconic East Village Pop Surrealist Kenny Scharf – contemporary of the likes of Warhol, Basquiat and Keith Haring – who put his design hat on to create limited edition labels for the holiday season to raise $200,000 for children’s causes around the world. 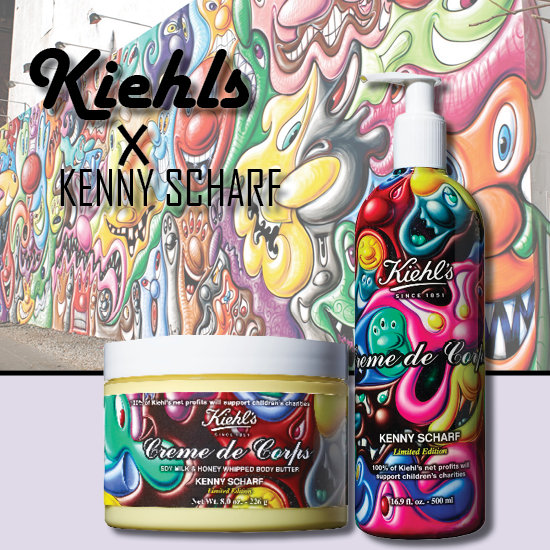 Having raised an amazing $600,000 through previous holiday initiatives, Kiehl’s invited Scharf to design its 4th Annual limited edition Crème de Corps Collection, with 100 per cent of net profit from each item sold going toward benefitting more than 40 children’s causes around the world. The three-piece collection with the limited edition Scharf-designed label includes Crème de Corps classic formula in a 250ml and 500ml size, and my favourite – the truly decadent, light-as-air Crème de Corps Soy Milk & Honey Whipped Body Butter in a tub. I can’t go through a summer – or a winter, actually! - without this stuff, which is the ultimate happiness for dry, dehydrated skin. All are on counter right now so get shopping – for your own good and the good of children’s causes all around the world!